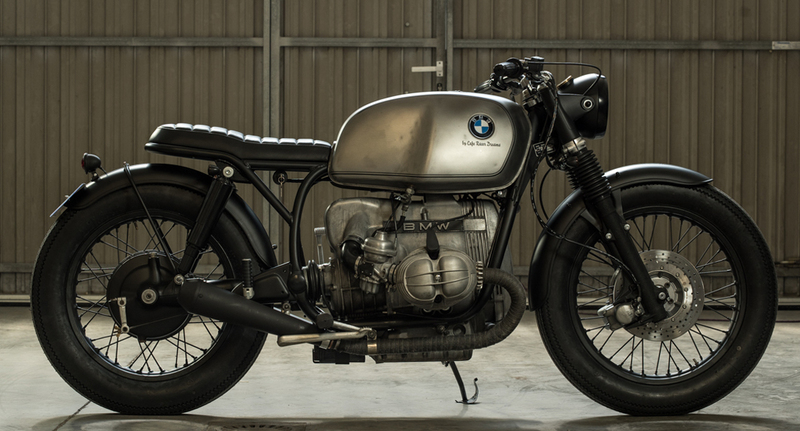 Article written by Gareth Charlton for The Bike Shed about CRD65 Cafe Racer. Classics, staples, thoroughbreds. In every genre their are always standards that no matter how oft repeated maintain their appeal. A red Ferrari, a hollywood blond, a 12 bar blues, they just keep on coming and with damn good reason. In the new wave custom motorcycle scene it does not get much more classic than a stripped clean machine with a bare metal tank, brat seat and firestone rubber, it’s allure just endures. Anthony wanted his piece of classic custom culture and with his mind set on the details approached the professionals to guarantee the execution lived up to the dream. 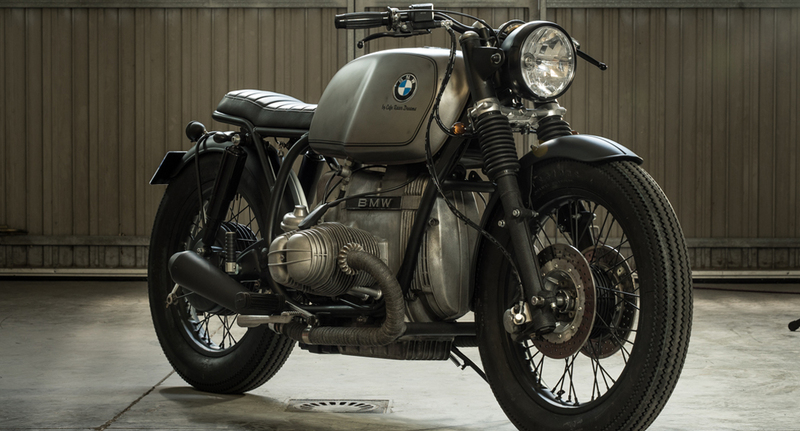 Cafe Racer Dreams of Madrid are a shop at the top of the game. Each and every machine a lesson in the perfect actualisation of a customers dream, the clue is in their moniker. Chief amongst those specifics were references to the style and stance of CRD51 and the design of CRD50, the donor was naturally the much beloved BMW R100. 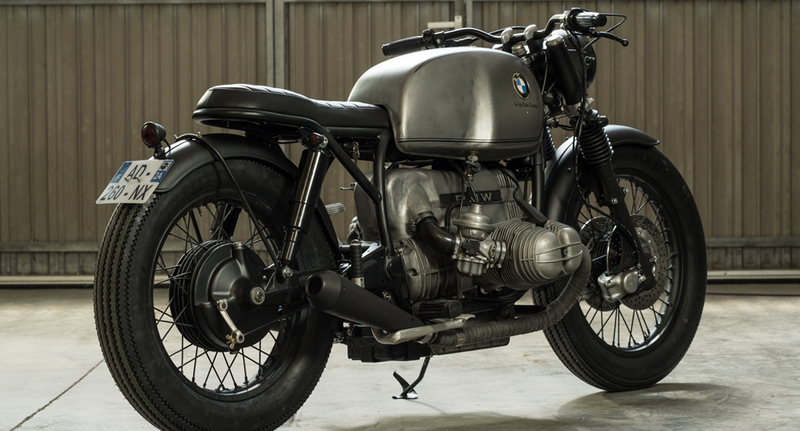 The team at Cafe Racer dreams set to work slamming the BMW to the floor with suspension and subframe changes. Long, low and muscular were the desired characteristics, with the provision to whisk a pillion away to any required location. The rear fender is set low, hugging the wheel so tightly that at a casual glance the seat sits alone above an un-shrouded wheel. The guards, frame, exhaust and wheels all received a coat of the black stuff keeping the palette traditionally monochrome. Fork gaiters, classic bars, enclosed shocks, smokey indicators and black lights fore and aft fulfil the theme. Cafe Racer Dreams have not attempted to reinvent the genre with this build, they have instead played to the strengths of the donor machine and materials used while inevitably implementing their elite execution. The beauty of classic combination’s of colour and style is their inherent elegance and longevity. Like bacon, eggs and tomato, or petrol air and fire the combination’s on this beautiful beemer are the likes of which I will never tire. Click here if you want to see more pictures of CRD65 Cafe Racer in Instagram. You can follow this link to read the article that The Bike Shed dedicated to CRD65 Cafe Racer.